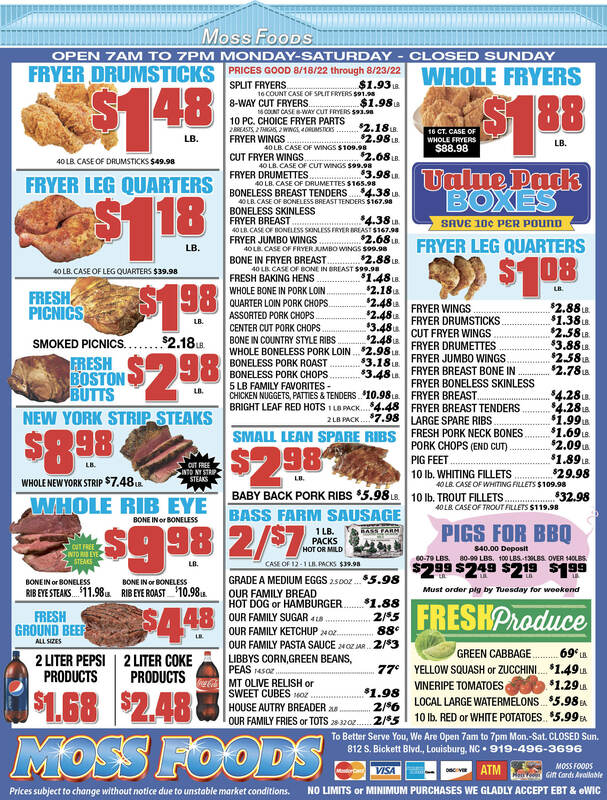 Showing 37 articles from January 29, 2014. 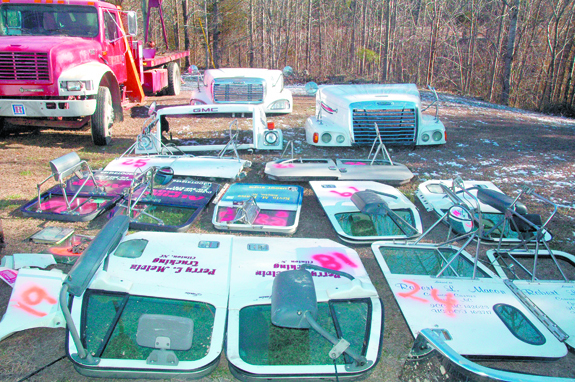 YOUNGSVILLE — Authorities arrested two men alleged to be at the center of a chop shop operation spread over eight counties. Along with agents from the State Department of Motor Vehicles, Franklin County sheriff’s deputies spent the better part of last week at Roger D. Nipper’s Moores Pond Road property, filling tractor trailers with evidence of stolen big-machine equipment. A much-anticipated — and probably over-promised by meteorologists — winter storm crossed Franklin County late Tuesday and early Wednesday morning, dropping about 2 to 3 inches of a powdery snow that seemed to cause few problems. Of much bigger concern were downright cold temperatures, hitting about 16 degrees Wednesday morning but expected to drop into single digits Thursday night before Mother Nature was expected to change her mind by the weekend and push temperatures back toward a spring-like 60 degrees. LOUISBURG — County Manager Angela Harris let her statement speak for itself. And Franklin County commissioners said they were sorry that documents dating back to the 1800s were removed from the courthouse basement and burned. Neither Harris’ mum response, nor some commissioners’ apologies were warmly met, though, by members of the Franklin County Heritage Society. LAKE ROYALE — A federal agency was called in to investigate claims that the Lake Royale Property Owners Association discriminated against a family trying to settle into the private, recreational community. Eric Young said he and his family bought a property at the Lake about three years ago. In the spring of last year, Young said he, Lake Royale Board of Directors President Ryan Walker and an inspector at the Lake had a disagreement over whether Young was in violation of a septic tank permit. Franklin County school officials are creating new passwords for students and “taking security measures to another level,” according to School Superintendent Lisa Martin, after it was discovered Friday afternoon that one student had accessed the personal accounts of others. “We take this pretty seriously,” Dr. Martin said late Friday, adding that the student apparently only viewed the grades of at least seven other students. It’s January, it’s supposed to be cold, snowy! Okay, okay, enough talk of winter and far more than enough hysteria from the local weather prognosticators. Cold and a little sleet/snow are bad enough, but I’ve been seized with the almost irresistible urge to send cases of brown paper bags to all of the local TV stations so their weather gurus can breathe deeply into them and stop hyperventilating. One block apart but light years distant? My, my. What a difference one block can make! Both the Louisburg Town Council and the Franklin County Board of Commissioners meet within a block of each other — and normally, on the third Monday of each month, on the same night. But the similarity ends about there. Take one recent example, providing a park for recreation. In the last season of that legendary television show, there was an episode called The Apology. In that episode, George, who is incredibly neurotic, learns that a childhood friend, nicknamed “Stanky Hanky,” is a recovering alcoholic and — as part of Step 9 of the Alcoholics Anonymous’s Twelve Steps — is apologizing for all his old misdeeds. ‘Burngate’ special meeting not special! Is money biggest problem in our political system? 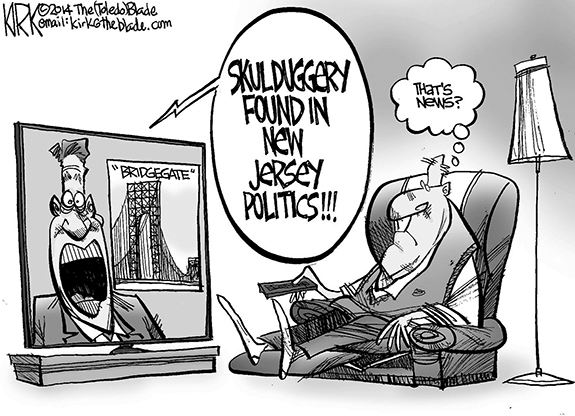 The influence of money is the biggest problem in America’s political system. In 1913, America adopted the 17th Amendment in large part because of how corrupt the process of naming United States Senators had become. Yet 100 years later, the radical General Assembly in Raleigh and de jure Governor Pat McCrory enacted legislation that will increase their financiers’ influence in North Carolina judicial elections and reduce the accountability of those judges to the citizens of Franklin County. When I went to Raleigh as your state senator, my top goal was to serve my constituents. And less than two months into the job, I was given the chance. AMYL ON THE MARK. 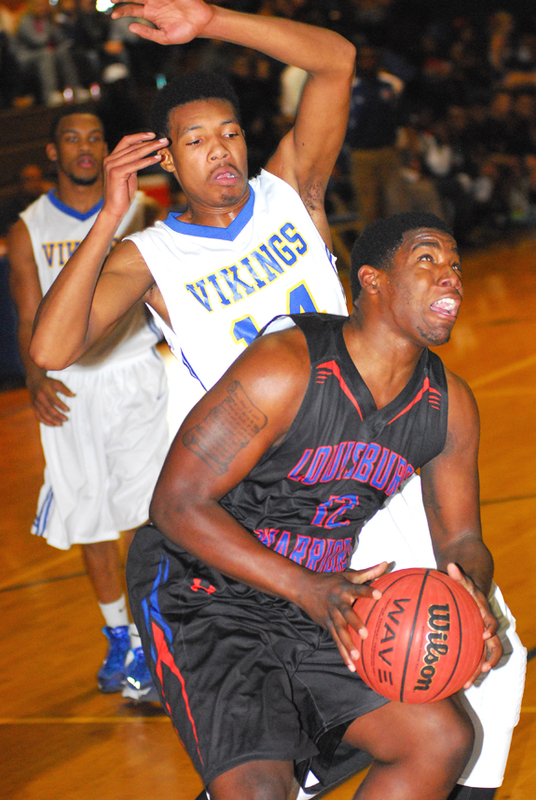 Louisburg High School senior Amyl Smith (right) scores in the paint last Friday night against homestanding Northwest Halifax. AURELIAN SPRINGS -- It doesn’t matter what sport it is -- a team always thrives much better when it has an identity. 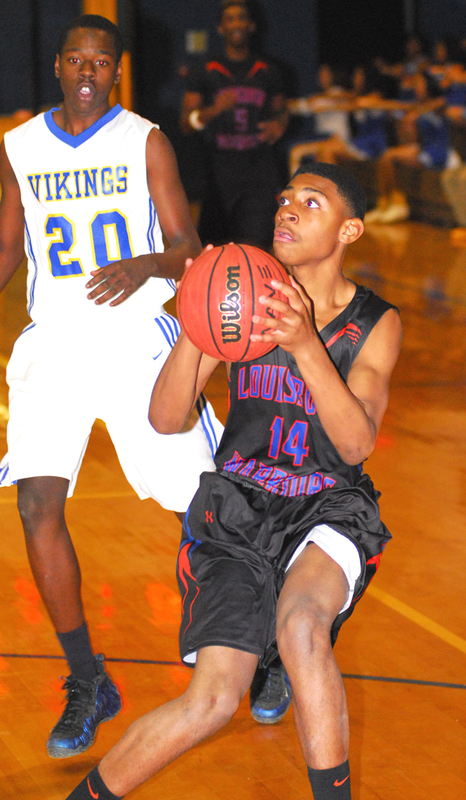 For the Louisburg High School men’s basketball squad, that identity involves excelling with a furious full-court pressure defense that consistently causes turnovers -- and easy transition buckets on the other end of the court. LHS head coach Dontae Lassiter implemented the press full-time in late December, and the Warriors have been rolling ever since. CLEARING A PATH. Louisburg’s Alkia Johnson (right) makes her way to the basket for the Lady Warriors during last Friday night’s road victory against Tar-Roanoke Athletic Conference foe Northwest Halifax. AURELIAN SPRINGS -- When a team is struggling, any victory is a quality one -- especially when it comes on the road. 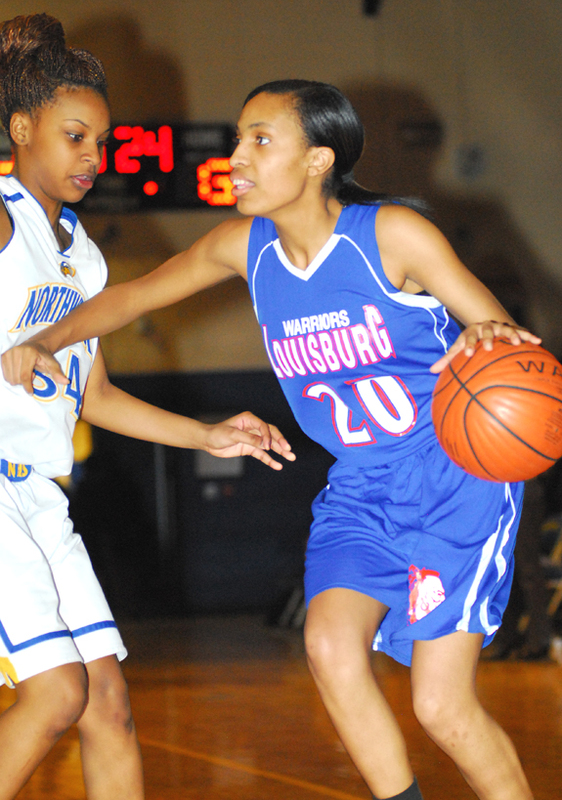 Louisburg High School’s girls basketball squad enjoyed a feel-good moment last Friday night as the Lady Warriors -- with Karen Gregory back in the lineup following an injury -- secured a clutch Tar-Roanoke Athletic Conference win at Northwest Halifax. KING RICHARD. 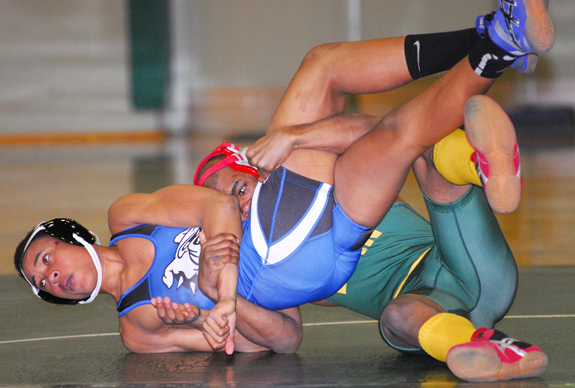 Bunn’s Richard Hall (right) takes control of this match last Thursday night against league wrestling opponent Durham School of Arts. 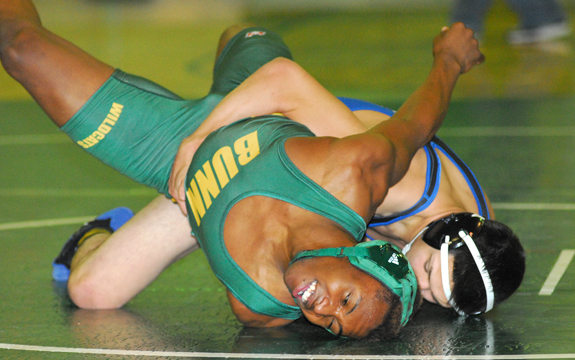 BUNN -- A once-promising team season for the Bunn High School mat squad has been plagued recently by injuries, defections and roster changes. Bunn’s once-full lineup is now featuring forfeits in several weight classes -- a fact that helped lead to the Wildcats’ 44-30 loss to Durham School of Arts in Northern Carolina Conference wrestling action last Thursday at the Bunn Dome. 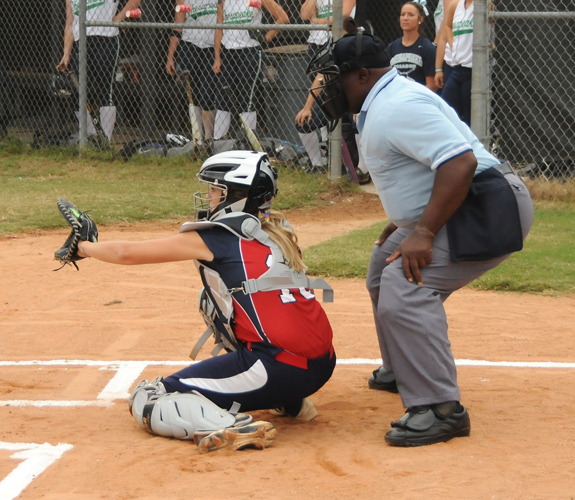 LOUISBURG -- The 2014 softball season will be the Louisburg College Lady Canes’ third under current head coach Don Stopa, who has led his squad to a two-year record of 50-35. 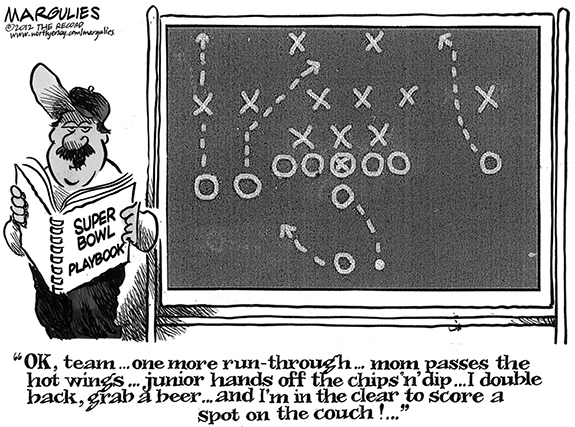 The Canes look to continue the success this year, but with a much more balanced all-around effort. FRANKLIN COUNTY -- This week’s snowstorm has backlogged area college and high school winter sports schedules -- slates that were already behind due to postponements last week. Most prep basketball squads will be playing the maximum of three games per week following the recent adverse weather. Bunn at Roanoke Rapids 6 p.m.
Southern Vance at Franklinton 6 p.m.
GREENVILLE -- Under the direction of ninth-year head coach and former Louisburg College skipper Billy Godwin, the East Carolina University baseball team held its first official team practice of the spring last Saturday afternoon at Clark-LeClair Stadium. WARREN COUNTY -- When legendary German film producer Jochen Kuenstler moved to the area with his family, he enrolled his son in Kenny Buffaloe’s Kyokushin Karate class at Chowan University. “I really didn’t even know who Mr. Kuenstler was,’’ Buffaloe said. Kuenstler, however, became immediately enamored with Buffaloe’s work -- along with his relationship with his son, Christian. ZEBULON -- The Cleveland Indians extended non-roster invitations to Major League spring training camp to five players who starred for the Carolina Mudcats in 2013. The list includes Francisco Lindor, Tyler Naquin, Joey Wendle, Tony Wolters and Jake Lowery. The Indians gave non-roster invitations to a total of 19 players. 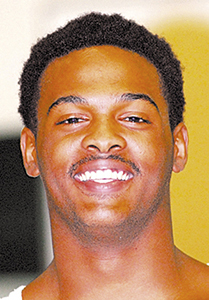 Malik Finley and the Bunn Wildcats were unable to play Tuesday night’s crucial Northern Carolina Conference boys basketball game at home against the Franklinton Red Rams. Louisburg’s Karen Gregory (left) reaches for a loose ball during last Friday night’s road girls basketball triumph against Northwest Halifas HS. Louisburg’s Calvin Manley drains a jump shot last Friday night against Northwest Halifax in a key Tar-Roanoke Athletic Conference boys basketball game. 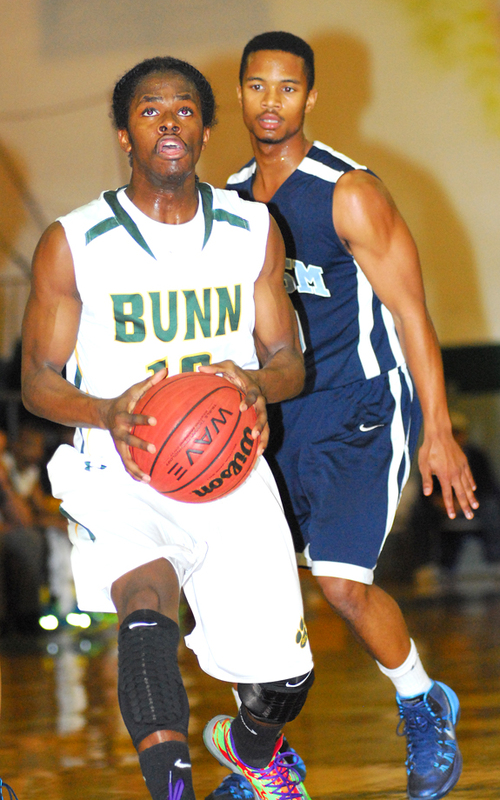 Bunn’s Ralph Davis (front) tries to twist his way out of a hold last Thursday against Durham School of Arts. 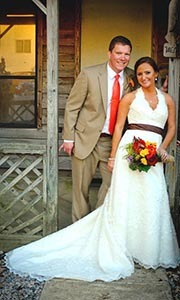 Jessica Nichole Bunn and Reed Myles Schafer were married on Saturday, Nov. 2, 2013 during a 4:30 p.m. outdoor, country ceremony at the bride’s homeplace, the home of Wayne and Elaine Bunn. The officiating minister was Matt Dinkins. The bride is the daughter of Wayne and Elaine Bunn of Pilot. As I was leaving Dr. Weidler’s office (our Louisburg chiropractor), a brochure about the potential risk of neck injuries as you text everyday caught my attention. I know by experience that the longer I work on the computer the more I am aware of a stiff neck and an aching back. As I read “Healthy Living,” a publication of the American Chiropractic Association (ACA), I realized the importance of taking small breaks any time you tilt your neck for long periods of time. 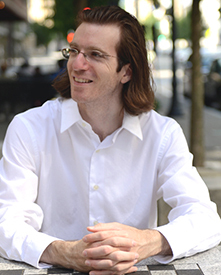 The first concert of the 2014 season at Warren County’s historic Cherry Hill will feature pianist Jonathan Levin. Born in North Carolina, Levin made his debut with the Raleigh Symphony Orchestra when he was 15. Since then, he has become a sought after recitalist and soloist, performing throughout the country in concert halls, museums, universities, schools, libraries and private salons. 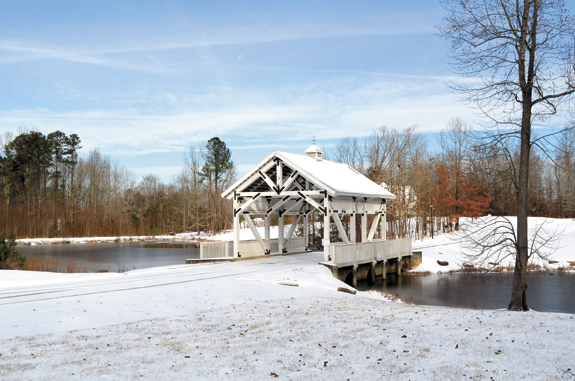 The JPAC at Louisburg College will host two special arts events around Valentine’s Day this year: a concert with The Lettermen in Dickson Auditorium on the day itself, Feb. 14, and a dinner theater production of Love Letters in The Norris Theatre the following evening. The following is a list of the Franklin County students who were named to the Headmaster’s List or A/B Honor Roll for the second quarter and first semester grading periods at Kerr-Vance Academy in Henderson. LOUISBURG — The Franklin County Board of Commissioners tabbed its county manager as its interim finance director. But not before publicly discussing the matter. Chuck Murray announced in December that he was retiring at the end of this month. The area’s first measurable snowfall in some time was actually fun for some — mostly those young enough to roll round in it, sled in it or, if they were feeling just a bit ornery, to pelt their friends with snowballs which, unfortunately, were difficult to make with the powdery stuff that fell across Franklin County Tuesday night and into Wednesday morning. 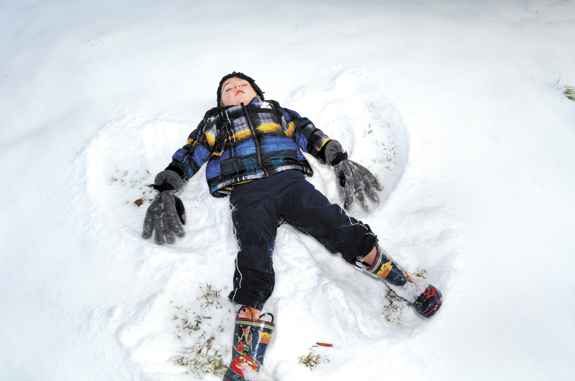 In the photo above, 5-year-old Keegan Walters tries his hand at making a snow angel and the fluffy snow was perfect for that endeavor. Four Franklin County 4-H members competed in the National 4-H Poultry and Egg Conference Avian Bowl held in Louisville, Ky, in November. The competition was in conjunction with the North American International Livestock Exposition (NAILE). Franklin County 4-H volunteer Alesia Moore coached the team. 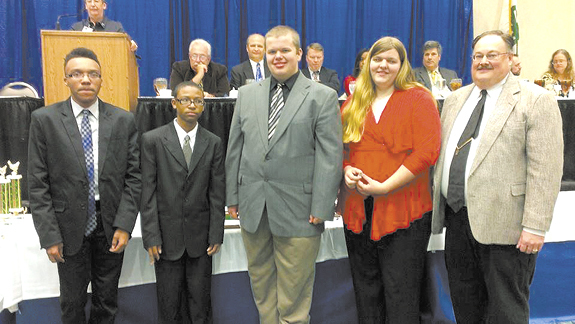 The Franklin County 4-H Avian Bowl team won gold at the first NC State Avian Bowl competition in July and earned a trip to the nationals. 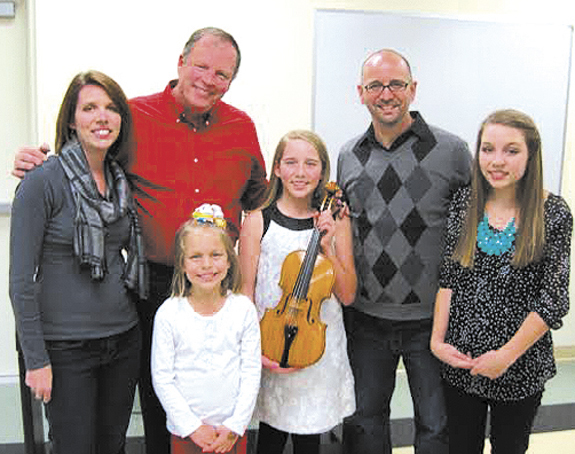 Another 4-H youth received her very own violin over the Christmas Holiday by entering an essay contest hosted by local violin maker Mike Anderson. Anderson decided that he wanted to give away one of his handcrafted violins to a deserving youth for Christmas. After an essay review process, he chose Aubrey Pratt a 12-year-old from Youngsville and a Franklin County 4-H’er.